Oh, I DO love this time of year!! I love the changing leaves, I love the chilly temperatures and I love Halloween! When I was a child, we had a costume box. My siblings (if any read) will remember, in fact it is either still there or someone inherited it. It had dance costumes, little bo peep, numerous clown costumes, old cheerleader uniforms and a few other odds and ends to different costumes. I guess 10 kids, with probably 10-12 costumes a piece warranted keeping anything possible that might resemble a piece of a future costume! Oh yea, we had little red riding hood too! I remember dressing up for school, we would have a pumpkin decorating contest because Mr. Murray the P.E. teacher had a farm and would bring the entire school pumpkins! Then we would walk downtown to the Halloween parade with our class and walk in the parade. I can remember being a clown numerous times, I guess it was easiest for my mom! I was a referee once and wore my dads uniform stuffed with pillows. I was a punk rocker, and oh yea, did I mention a clown? Oh I was little bo peep once too. After the parade we would go home, or go to a friends house and wait for dinner and then trick or treating. I am realizing a few places, my former home in New Jersey has trick or treat on a weekend before Halloween. I just don't get that. Part of the fun was being up to late, and bouncing off the walls with excitment waiting until we could break into the bags full of candy! I can remember being on emotional overload while trick or treating. Excited to be trick or treating and terrified when someone in a mask would approach me. I STILL hate that, it just FREAKS me out and I am not responsible for the damage or bodily harm that it causes me to inflict! We always watched the Charlie Brown Halloween specials and once my dad let me watch some of Amityville Horror. My mom almost killed him. I thought I was so lucky because MY dad let me watch some of it. Probably it was 10 minutes before my mom busted him but it was 10 minutes my friends weren't allowed to watch! HA! When Cody was little, we would make some dinner and call it something gross. Spaghetti and meatballs was brains and eyeballs on Halloween, and all that kind of stuff. We would make cookies or treats, and these witches fingers were part of our Halloween "thing". Cream together, sugar, egg and butter, add in flour, salt, and vanilla. When it is completely combined add in green food coloring. Add as much or as little as it takes for you to achieve the witchy color of green you like! Refrigerate for 45 minutes. When dough is nice and firm, start molding fingers! I used a cookie scoop so I could get the same amount each time. Make the fingers skinnier than you think you should because they will spread a bit. Using a skewer or toothpick, make the lines of the finger, and the knuckle. Carefully press a sliced almond in at the end for the fingernail! Remember these are old haggety witch fingers, they can be crooked and gnarly! In fact they SHOULD be! Place on a cookie sheet lined with parchment paper. In a preheated 325 oven, bake for 15-20 minutes. I baked mine 15 because I like to UNDERcook them a bit so they stay soft. I added a glaze to mine as well. I just don't like a dry sugar type cookie no matter how tasty it is! I just used 2 tbsp milk, 1/2 cup powdered sugar, and 1/2 tsp of vanilla. I added green food coloring so it was the same color or close to the same. I wanted to make sure you could still see the finger detail of the cookies! I drizzled the cookies with the green drizzle. You can barely even see it! Make sure to let the cookies cool ON the pan before drizzling and then let the drizzle set! Enjoy a SPOOKY and FUN Halloween! Cool! So glad you like them. They are fun for sure!! Thanks for reading! THANK YOU...I just made another batch this morning and thought they tasted salty. Went back to my notes and I MISTYPED the recipe. I feel terrible and am making the correction RIGHT NOW! Thanks for reading and thank you for being honest, AND still positive!! Thanks for reading! 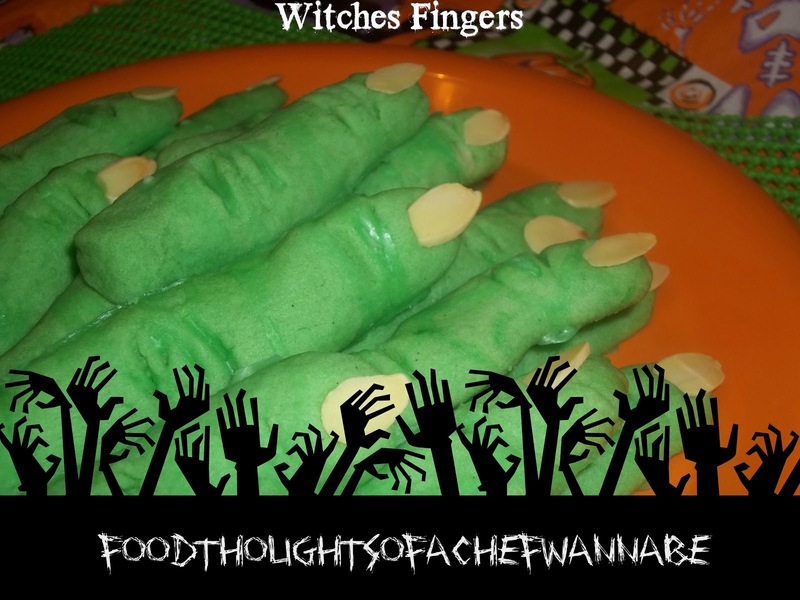 Thanks for sharing these on our Freaky Friends Friday Linky party, they look great.